Preparing for tomorrow is what this multifaceted book is all about. 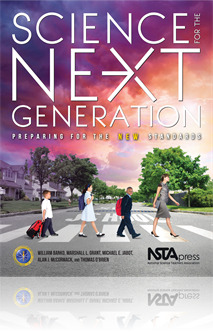 If you’re an elementary school teacher, you’ll see your unique perspective reflected in material designed to get you ready for both a new generation of science students and the new Framework for K–12 Science Education and Next Generation Science Standards (NGSS). •	how literacy must be connected to science lessons. Plus: Perhaps most useful, you get seven sample activities that demonstrate how to use the NGSS in your lessons on physical, life, and Earth and space sciences. Whether science is one of several disciplines you teach or your primary area of expertise, Science for the Next Generation is an invaluable resource. It offers the essential background, content, and practices you need to implement the new standards at the K–5 level.